Placing a major league sports stadium in an urban context has been a challenge for decades. American cities have latched onto the big projects as the silver bullet of urban revitalization. They’ve often fallen short on that promise. At one time, stadiums and arenas used to more or less fit on a city block (see Sportsmans Park, or Wrigley Field), but that’s no longer true. Today’s behemoths interrupt street grids, loom over neighboring buildings and present a form quite foreign to the city. However, the urban Major League Soccer stadium may be an exception. The 18,000-25,000 seat soccer specific venues that MLS teams have been building are at a more human, urban, scale than NFL or MLB palaces, and more open and engaging in the urban context than NBA or NHL arenas. In spite of the challenges, stadiums can and should be better at adding interest and vitality to an urban site. In fact, St. Louis has an incredible opportunity to build a physical manifestation of its position as America’s greatest sports city. 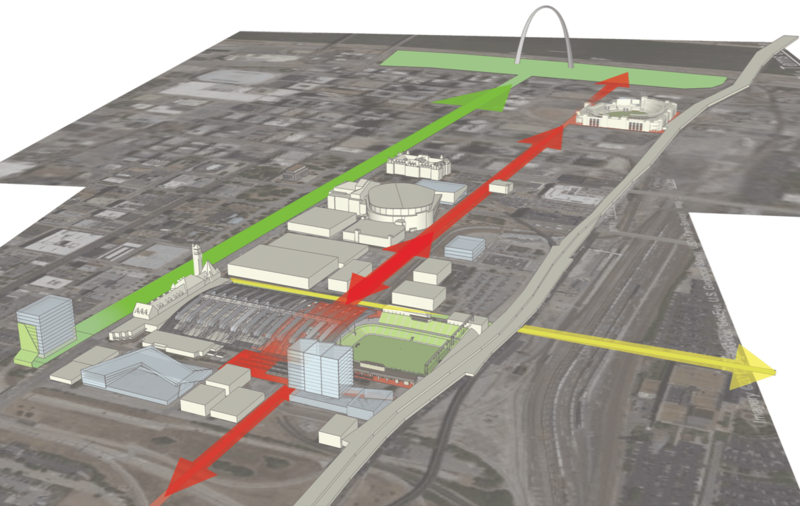 With the significant investment in Union Station by Lodging Hospitality Management (LHM), and the continued success of both the Scottrade Center and Busch Stadium, we envision an MLS stadium as the bookend to Clark Avenue, the “Greatest sports street in America”. Our self-initiated stadium development study consists of the stadium, tower, retail/residential infill, and tower on the gateway mall. We always start with the notion that individual buildings should do their part to improve the city, in whatever capacity possible. On a scale like our historic downtown, and especially adjacent to Union Station, this challenge is about the relationship of landmarks and larger buildings. Views also play a key part in contextual design. Good infill at this scale should do its best to preserve existing views where they are important, while hopefully creating new iconic views. An example of getting this wrong is Gateway One, which as we know, has ruined the view down a portion of the Gateway Mall. 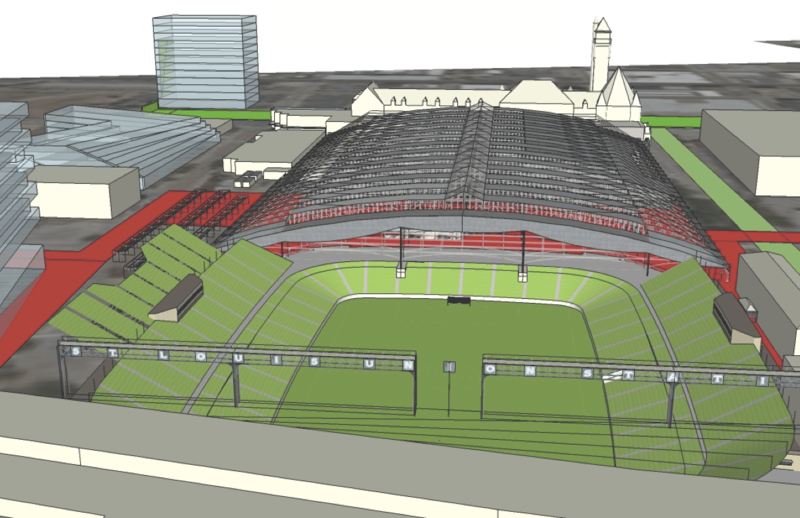 In this case, we feel it is important that the design of the stadium preserves the iconic view of Union Station. After all, that’s how most people currently experience it. 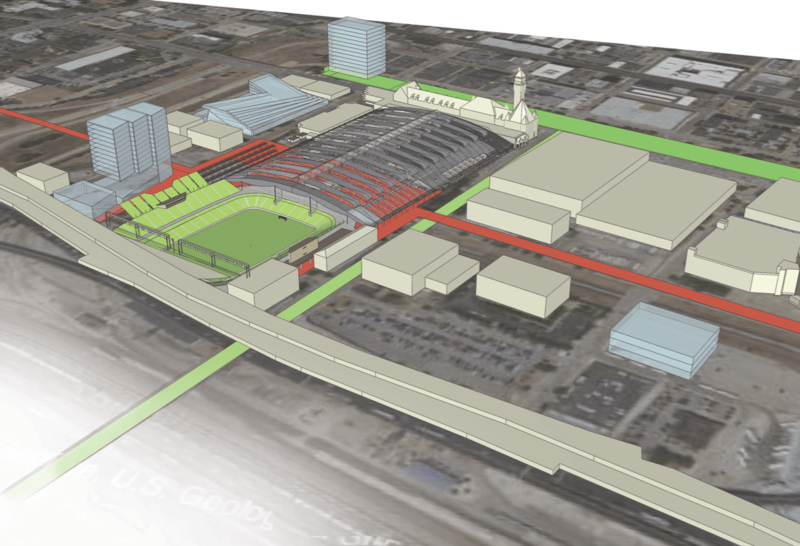 We are showing a sunken stadium with a concourse at grade, so Union Station flows directly into the stadium. This overlap has a lot of potential to create a remarkable gameday experience. To make this happen, seats get shifted from the south and north to the west, which maximizes the amount of people who are able to look towards the arch during a game. Good infill, even, or perhaps especially, large stadiums, should respect the streetwall. In this case, we propose preserving some buildings, which the stadium can then fit around and over, giving a nuanced edge to the streetwall. With excitement building in St. Louis about the possibility of having an MLS franchise, it’s the perfect moment to explore the design possibilities of an urban stadium. Thoughtful and deliberate architecture and urban planning can be a big part of the stadium’s success, and help create an iconic destination with Clark Avenue as the “Greatest sports street in America”.